You might have noticed that I added some new categories last month. One of them is “my art history“. I figured that it would give me a place to show how little has changed over the years! When the studio building where I worked burned down in 1999, it took me a while to realize that one of the biggest loses would be my sketchbooks- years of them. I have been thinking about the recurring themes in my artwork. If I post examples of the artwork with those themes, it is a way of remembering what was in those sketchbooks. And as I try to make some kind of order in my studio these days, I keep finding examples. 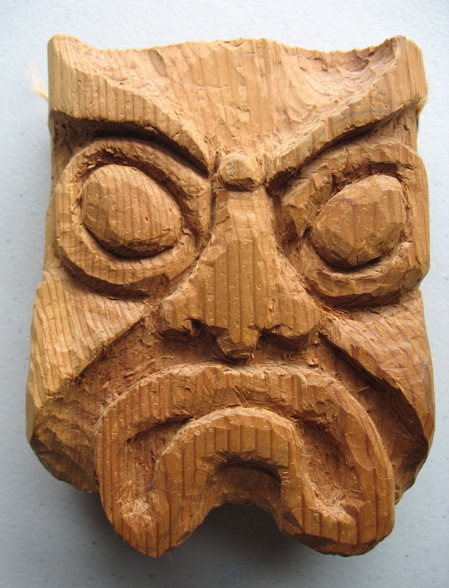 I figured this needed to be posted today, since I finished up another tiki yesterday. 1972, I think. 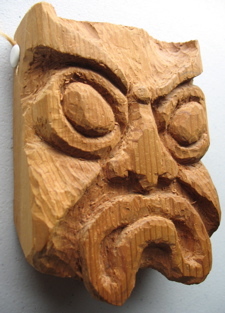 Carved out of a scrap end of a 2 x 4. In an early 70′s definition of feminism, my 2 friends and I signed up to take wood shop in my senior year in High School. We were the groundbreakers- the first girls through the door. This was a little project I did then. 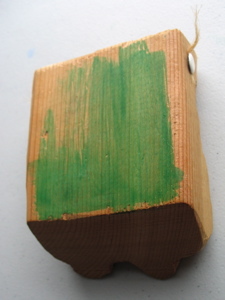 It is 3″ x 3″. I did this the same year as my sampler. I have no memory of how I transfered the image onto the fabric, but I see on the back that I wasn’t happy with my first try. and some other stuff- Last Saturday, I broke down and got myself a subscription to Embroidery. I was so excited when I got an envelope in the mail today- 2 magazines- yippee! And another thing- I am having problems with my comments and email. I am not getting emails when someone comments so I have to go check things out regularly and when I email back, it might look a little odd. It all has to do with over-zealous spam filters or something… arg! This entry was posted in blogging, General, my art history, personal by mimik. Bookmark the permalink. What a loss! I try…hard…to forget some of the “art” I’ve made, but I love my sketchbooks as they may be the only proof my children will have that I could actually draw a straight line. But it’s always special to see someone’s creative progression and I can’t wait to see more of your art history. Great idea! 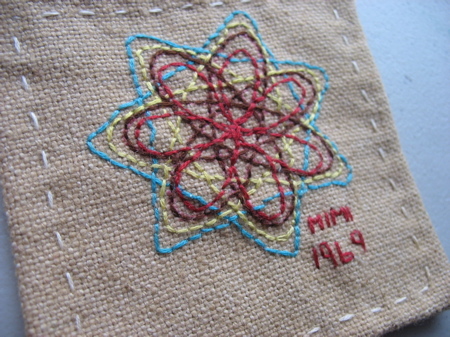 I used to embroider a lot, the embroidery magazine site is very interesting. Hope you don’t mind, but I tagged you for the MeMe game. You can check out the rules at my site: http://sewsydney.wordpress.com. No worries if you are too busy to play! I love, love, love your work. You are so talented. I can’t believe the detail on your dolls. It’s all in a broader context. I love the idea of the history and continuum. Being able to trace that vein of inspiration through new innovations and (tweedy) tweakings. 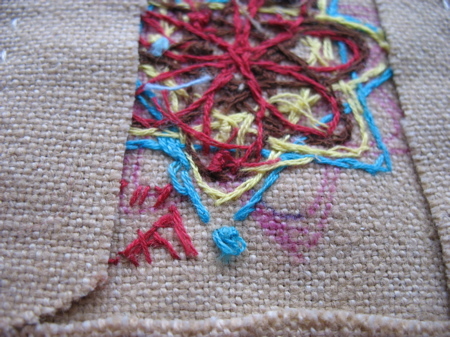 And for what it’s worth that’s hardly the ugliest sampler ever. The little aquatic scene – so good. I always say that the answer to all email problems is this: Gmail. Love it, can’t live w/o it.